This entry was posted in Crafts and tagged Cards, Quilling on February 25, 2015 by milai. Background: Plain purple cardstock that I painstakingly embossed against an embossing plate (AE 1217) using Fiskars Dual Tip Stylus. I said painstakingly because this was the first time I tried this method and the effort of tracing the stylus against the plate was quite tiring. But the end result’s all worth it. Borders: Both top and bottom borders are giftwrapper pieces. Accent: Quilled cones arranged into a set of flower. I’m not really particular when it comes to my creations so I usually come up with flowers that may or may not exist in real life. Te he. The leaves on the left side were made through paper-folding while the one on the right and the swirls were quilled. Sentiment: Birthday wrapper cut-out. I then added a giftwrapper piece with stitch effect as its accent. To finish this off, I added a metallic purple pink butterfly. This entry was posted in Crafts and tagged Cards, Quilling on January 9, 2013 by milai. Background: The top is plain dark blue paper crumpled and creased then sprinkled with Leeho glitter glue in turquoise and blue. The bottom is yellow gold corrugated cardboard. Main design: Quilled angel. On the upper right corner is a quilled star sprinkled with gold glitter, also by Leeho. Accent: Four light yellow sequins placed on the lower left side corner. Sentiment: Computer print-out colored using Crayola crayon in dandelion, topped with clear glue to give it texture. This entry was posted in Crafts and tagged Angel, Cards, Christmas, Quilling, Stars on December 21, 2012 by milai. Quilled purple and blue flowers with pink center on a diamond-shaped plain white card stock with quilling paper as its border. The background is made from two sets of Martha Stewart Deep Edge Punch Garden Trellis puncher. One white pearl in the center as an accent. The sentiment is printed out with the words traced using Sharpie Ultra Fine Point Permanent Marker in blue. The background is colored using the same marker in shades of dark and light purple. Three metallic pink sequins are then added as an accent. Craft-punch cut-outs arranged in swirls completed this card’s dainty look. 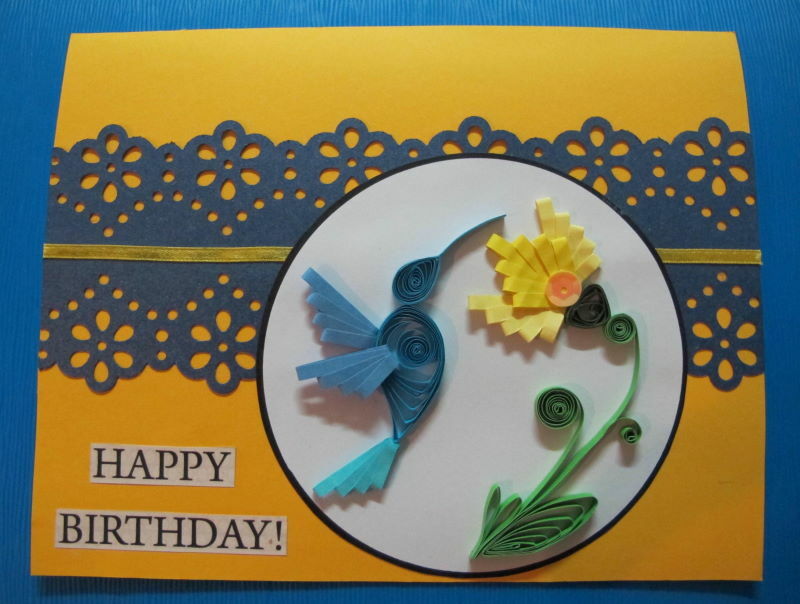 This entry was posted in Crafts and tagged Cards, Quilling on November 18, 2012 by milai.